Dortmund have announced that tonight’s clash against monaco has been cancelled and will be played on thursday at 18:45 local time instead. This information comes after three explosions went off near Dortmund’s team bus. Marc Bartra was injured after three explosions went off near Borussia Dortmund’s team bus as they prepared to travel for Tuesday’s Champions League quarter-final against Monaco. 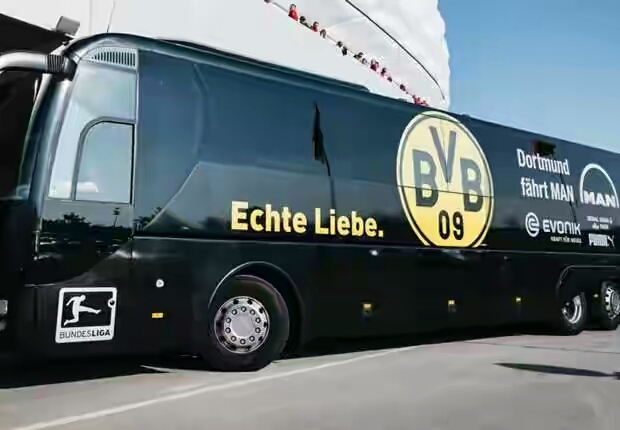 A statement from the local police has confirmed that an explosion occurred as the team set off for the first leg of their tie at Signal Iduna Park. “In the run-up to the Champions League match of BVB against AS Monaco, there was an explosion near the BVB team teambus shortly after 7 pm,” it read. “To our knowledge the windows of the bus are cracked (fully or partly) and one person was injured. Meanwhile, Dortmund confirmed that the game has been postponed and would be played on Thursday.